Matthew 8–12 presents a continuation of the Savior’s Galilean ministry overviewed in Matthew 4:23: “Jesus went about all Galilee, teaching … and preaching … and healing all manner of sickness” (see also Matthew 9:35). Having recorded an important part of the Savior’s teaching and preaching in chapters 5–7, Matthew next documented in chapters 8–9 numerous miracles that Jesus Christ performed. 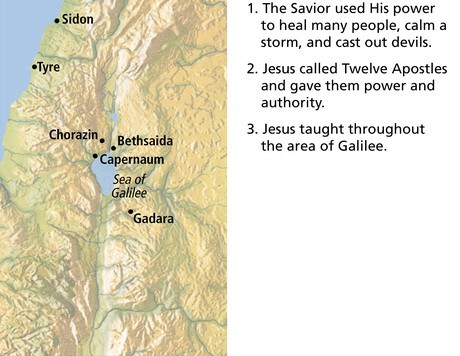 These miracles illustrate the Savior’s power and authority over all things and prepare readers for Matthew 10, which records the Savior conferring on His Apostles the power to minister and to perform similar miracles. The Savior’s power can give us confidence in His promise and ability to lighten the burdens of all who come unto Him (see Matthew 11:28–30). Jesus Christ healed a leper, a centurion’s son, and Peter’s mother-in-law. He cast out many devils and calmed a storm. Jesus Christ healed a paralytic and a woman with an issue of blood, and He raised a ruler’s (Jairus’s) daughter from the dead. Jesus called Matthew to be His disciple. When accused of associating with publicans and sinners, Jesus responded that He came to call sinners to repentance. Jesus Christ empowered and instructed the Twelve Apostles and sent them forth to preach, minister, and heal the sick. He warned the Apostles of opposition they would face and counseled them to take up their cross and follow Him. He taught that those who receive His Apostles receive Him. Jesus Christ affirmed the greatness of John the Baptist. He also upbraided the wicked and proclaimed judgment upon them. He invited the heavy-laden to come unto Him and take His yoke upon them. Jesus Christ healed a man on the Sabbath and was accused by Pharisees of casting out devils by Satan’s power. He spoke of judgment against the unrepentant and those who blaspheme against the Holy Ghost. His “family” consists of those who do the will of Father in Heaven. Many gospel teachers have found it helpful to have reverent Church music playing in the background as students enter the classroom. Music is a powerful tool for inviting the Spirit and can be an effective way to help students prepare to learn. Sometimes this music might relate to the lesson being taught that day. Note to teacher: The miracles recorded in Matthew 8–9 will be taught in detail in Mark and Luke. In this lesson, they are referred to only briefly to help students understand the power that the Savior bestowed on the Twelve Apostles. How do the responses listed on the board show that the power and authority of the Savior was different from the power and authority the scribes and Pharisees claimed to have? Note to teacher: You will want to leave this list on the board because you will refer back to the list of responses later in the lesson. 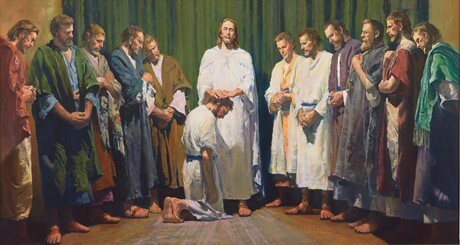 Show the picture Christ Ordaining the Apostles ( Gospel Art Book , no. 38; see also LDS.org), and have a student read Matthew 10:1. According to this verse, what could the Apostles do with the power the Savior gave to them? As students share their responses, emphasize this truth: Jesus Christ came with power and authority, which He conferred on His Twelve Apostles. What general observations do you have about these twelve men? Which parts of the Savior’s counsel do you think would have given the Apostles the greatest comfort? Though the Savior gave this counsel specifically to His Apostles, what parts of this counsel do you think also apply to all members of the Church? How does the counsel apply? As students work on reading their assigned verses and accompanying questions, you might consider having them study alone or in pairs, and then you could invite several students from each group to present their answers to the class. You might conclude this portion of the lesson by inviting a few students to share the feelings they have for living Apostles and how they have witnessed apostolic power and authority today. Note to teacher: Before teaching these three verses, you might quickly give students an overview of Matthew 11:1–27 by reading to them the chapter overview for Matthew 11 found at the beginning of this lesson. Or if you feel that your students need additional instruction on the life of John the Baptist, you could consider teaching the information under “Matthew 11:1–19. 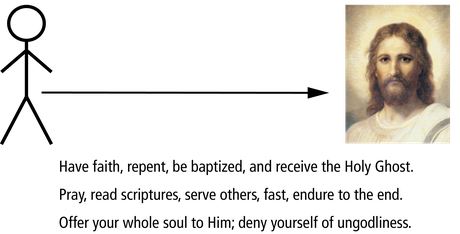 John the Baptist,” found in the supplemental teaching ideas for this lesson. Ask students to read these verses and look for what is repeated, looking especially at the verbs used in the verses. Invite the class to silently read Matthew 11:28–30 and ponder how the Savior’s invitation relates to the list on the board of burdens people carry and burdens the Savior relieved through His miracles. What do you find encouraging in President Howard W. Hunter’s statement? How have you experienced the rest that comes from coming unto Jesus Christ and taking upon yourself His yoke? Point out that the “rest” promised by the Savior does not mean that all our burdens will be taken from us. In many instances, the Savior strengthens us to bear our burdens and causes our burdens to feel lighter (see Mosiah 24:15). If we are faithful, the final “rest” we are promised is “the fulness of his glory” (D&C 84:24), which means exaltation. As the Spirit prompts you, this might be an appropriate time to speak of your love for the Savior and share how He has relieved your heavy burdens or strengthened you in bearing your burdens because you have taken upon yourself His yoke. Summarizing allows you to cover a large amount of material in a short amount of time. It can also help students understand the context of what they read. You can summarize by reviewing chapter or section headings in the scriptures, identifying key words or phrases, pointing out a few highlights in the story line, or mentioning a few main ideas. The chapter overviews in this teacher manual can also help you summarize as needed. Summarize Matthew 12:1–28 by pointing out that the Savior proclaimed His identity and performed miracles, and Matthew recorded how the Jewish people and leaders chose to react to Him. The Savior healed many, causing some of the Jewish people to wonder aloud whether He was the “son of David” (Matthew 12:23), meaning the Messiah. Many were willing to commit to follow Him. On the other hand, the Pharisees accused Him of being evil, openly opposed Him, and conspired how they might destroy Him (see Matthew 12:14, 24). What does this tell you about the conversations Jesus was having with the Pharisees at that time? Once we have been presented with evidences of Christ’s divinity, we cannot remain neutral in our attitudes and actions toward Him. Being a disciple of Jesus Christ requires our committed devotion. In the Day of Judgment, the Lord will judge us based upon what is in our hearts. Matthew 12:30, 33–37 and the student manual commentaries for Matthew 12:22–30, 33 and for Matthew 12:30. Matthew 12:38–42 and the student manual commentary for Matthew 12:41–42. Matthew 12:43–45 and the student manual commentary for Matthew 12:31–32, 43–45. As groups study their assigned material, have them (1) identify which statement on the board they feel best reflects the Savior’s teachings to the Pharisees, as recorded in their assigned verses; (2) prepare to explain to the rest of the class how the Savior used these teachings to rebuke the Pharisees; and (3) prepare to share how they think their assigned verses apply to us today. After sufficient time, have several groups report their findings. If you assigned more than one group to study the same material, you might have just one group report their findings and the other group(s) share any additional information they discussed. Conclude by sharing your testimony of this truth: Being a disciple of Jesus Christ requires our committed devotion to Him. Show the class an old article of clothing with a hole in it and explain that the Savior made a statement about patching a hole in an old garment. Ask students to look in Matthew 9:16 and find out what He said. Then have students read Matthew 9:14 and identify the question that elicited Jesus Christ’s response in verses 15–17. (“Why do we and the Pharisees fast oft, but thy disciples fast not?”) Have students read Matthew 9:15–17 and the student manual commentary for Matthew 9:14–17, and ask students to identify truths they learn from these verses. One truth that should come from the discussion is: The gospel taught by Jesus Christ was not meant to repair what was wrong with Jewish beliefs and practices of His day, but rather to replace false beliefs and religious practices. If you have recent converts in your class, you might have them share a few of the gospel truths that were important in their conversion. Consider having students quietly study Matthew 10:37–39 and the student manual commentaries for Matthew 10:34–37 and for Matthew 10:39. As follow-up questions, you might ask: What does the Lord promise to those who make Him and His kingdom preeminent in their lives? What does that promise mean to you? In what types of situations would these verses be particularly applicable? Testify to students: The Lord is mindful of and will bless those who lose their lives for His sake. Have students read Matthew 11:1–5, and ask: What did John ask his followers to do, as recorded in these verses? Explain that even when in prison, John continued to testify and to send his disciples to Jesus Christ. Have students silently study Matthew 11:7–19. As they study, have them think about why the Savior would teach that John the Baptist is among the greatest prophets ever to live. Conduct a follow-up discussion with the students about the greatness of John the Baptist. The student manual commentaries for Matthew 11:13–14 and for Luke 7:24–30 provide helpful information for this discussion. Also, the following scripture passages might be used to deepen the students’ appreciation and understanding of John the Baptist: Isaiah 40:3; Malachi 3:1; Luke 1:76–77; John 5:32–35; 1 Nephi 10:7–10; Doctrine and Covenants 84:27–28. Help students understand that John the Baptist’s life illustrates these principles: The servants of God do God’s will, not man’s will. The servants of God do not seek to satisfy public opinion. Explain to students that anciently the sin of blasphemy (speaking disrespectfully or irreverently of God or sacred things) was considered one of the most serious sins and was punishable by death. Ask students what is meant by “blasphemy against the Holy Ghost.” (This is also referred to as the “sin against the Holy Ghost,” “denying the Holy Ghost,” or “the unpardonable sin.”) Have students study the statement by the Prophet Joseph Smith in the student manual commentary for Matthew 12:31–32, 43–45 as well as Doctrine and Covenants 29:43–45; 76:30–37; 88:32. A main doctrine that should come out of this discussion is: The only sin that cannot be forgiven is blasphemy against the Holy Ghost. To help students understand why they do not need to be overly anxious about committing this sin, consider discussing the quotations by President Spencer W. Kimball and President Boyd K. Packer, also in the student manual commentary for Matthew 12:31–32, 43–45. Point out that the Savior’s teachings in Matthew 12:43–45 apply to blasphemy against the Holy Ghost. However, these teachings can also help us understand the following principle: Repentance means not just forsaking sin but also replacing sin with faith in Jesus Christ. You might have students quietly study Matthew 12:43–45; Doctrine and Covenants 58:43; and Doctrine and Covenants 82:7, looking for how they would apply these verses in their lives. After sufficient time to study the material, have students write a two- or three-sentence summary of what they learned. Students could then either share their summary with the class or with someone sitting next to them. “For more than 10 years, I watched [an inappropriate television show] while rearing children. This was the only time during the day I could sit down and rest. When I decided to give up this bad habit I could hardly get by without watching it daily. Then I decided I must get something to take its place, so every day at the appointed hour, I would read the scriptures. I would read them the entire time the program was aired. It was difficult, but it paid off in gospel knowledge and spiritual dividends” (Phyllis L. Berry, in “How to Overcome a Bad Habit,” Church News, Jan. 16, 1988, 15). How does replacing sinful habits with more productive actions aid in forsaking sins? To help students explore possible applications for this principle, you could ask them to name positive actions that can fill an “empty” life with more faith in Christ and thus replace bad habits. List these actions on the board, and then encourage students to choose one of the items on the board—or another worthwhile activity—and use it to replace a bad habit or some action of lesser importance in their lives.